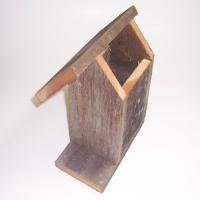 The classic birdhouse, the name of this project, is called this because it is the basic style of birdhouses that you see most often. It is extremely easy to build and doesn't cost anything if you have an old fence board* laying around. 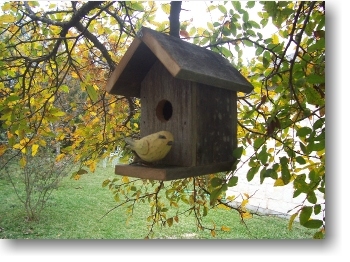 There are many styles and shapes of birdhouses, but the classic style has always survived over the years. This is a great class project for young students and scouts that are interested in woodworking. 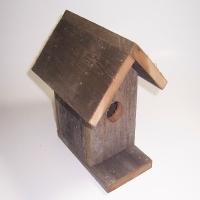 By building this project, they can get the feel for what woodworking is like, and when they are finished with the project, they have a birdhouse for their backyard. Before you begin assembling the pieces, take out two of the 7" x 4" pieces. 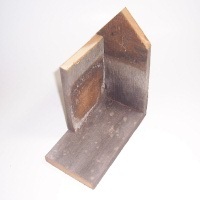 On one of the pieces, cut a 45 degree angle on both sides of one end to form a point (see diagrams below). This forms the shape of the roof. Repeat this process on the other 7" x 4" piece. All of the parts should now be cut and ready for assembly. 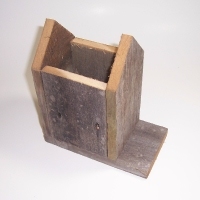 Step 1 - attach the back upright end-piece to the bottom piece (the remaining rectangular 7" x 4" piece). 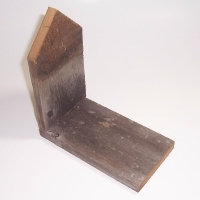 The end-piece should be attached to the top of the bottom piece. Step 2 - now that one end-piece is attached, position one of the side pieces as shown (with the taller end pointed upwards)and attach it securely against the bottom piece and the end piece. Repeat this process to attach the remaining side piece. Step 3 - attach the front end-piece as shown in the diagram. Step 4 - attach one side of the roof as shown. You don't have to split the difference evenly from front to back. I have mine positioned more towards the front (to give the bird more shade on his porch). Step 5 - attach the remaining roof section as shown in the diagram. Drill a 1 1/4" hole in the front with a paddle-bit. Visit The Cornell Lab of Ornithology and eBird to learn more about birds and birding.